Newberg, OR. St. Cousair Co., Ltd. (headquarters: Iizuna-machi, Nagano Prefecture) is a food manufacturing retailer(Food SPA) with more than 110 specialty stores nationwide, including St. Cousair brand stores and Kuze Fuku & Co. St. Cousair, Inc. (hereafter referred to as SCOO / headquarters: Newberg,Oregon / President: Naoki Kuze), a subsidiary of St. Cousair Co., Ltd., completed its first export of Sweet Vinegar drinks and the product is now on sale in St. Cousair and Kuze Fuku & Co. Stores in Japan. In March of 2015, St. Cousair sent Naoki Kuze, its director of overseas affairs to the West Coast of the United States. With the cooperation of the JETRO main office and its office in Nagano, Naoki conducted market research in the areas of the retail and business food manufacturing industries. In April of 2017, St. Cousair acquired the assets of the former Berry Noir Co-packing, consisting of 30 acres of farmland and a 1000 sq.ft. food production facility for the production of compotes, jams, juices and dressings. The existing employees and customers were retained after the acquisition. The employees were in agreement with SCOO’s management philosophy and decided to continue working. On April 29, 2017 (Japan time), executives of both Berry Noir and St. Cousair, as well as State Government representatives and officials from the Japanese Consulate in Portland, attended the signing ceremony and party for the agreement on the acquisition of Berry Noir’s assets. On May 1, St. Cousair held a ceremony to mark the beginning of production in the newly organized facility, and the next day, production of Sweet Vinegar drinks began. St. Cousair Co., Inc. had previously produced Sweet Vinegar Drinks at its factory in the town of Iizuna, Nagano, and since first production has received much support from customers in Japan. 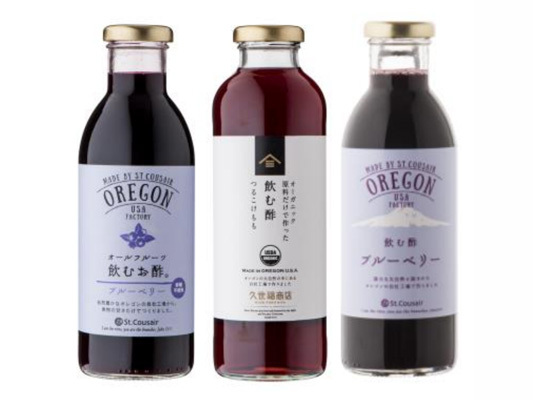 With these new, Oregon-made products, St. Cousair developed new recipes, such as those using only organic ingredients, and a sugar-free all-fruit type, as well as labeling and packaging the drinks as an "Oregon Series." Sales of three varieties of Sweet Vinegar Drinks will begin at St. Cousair Outlet stores in Japan on July 25, 2017. The flavors will be blueberry, pomegranate and grape. All three flavors will use apple vinegar and other fruit vinegars. They are sold in 460ml bottles at 880 yen each (plus tax). At the regular St. Cousair stores will be sold four varieties of the drink: blueberry, grape, pomegranate and cranberry. Each will be sugar-free and sold for 980 yen (plus tax). The organic varieties, grape, cranberry and pomegranate, will be sold at Kuze Fuku & Co. Stores for 980 yen each (plus tax). A special buy two get one free sales campaign will be done, and it is expected to be a very popular line of products. More SCOO Products to be Exported to Japan! Since we are urgently working to improve our production capacity due to increased product demand at and expansion of our stores in Japan, after this line of Sweet Vinegar Drinks, we will continue to aggressively carry out production of existing products in the future. At the same time, we will continue to produce high-quality products that make maximum use of our location in the state of Oregon. With the blueberry harvest in Oregon underway, we are currently beginning production of a blueberry compote for export to our stores in Japan. This compote will be made from fresh morning-picked Oregon blueberries, and will make a delicious topping for pancakes and other uses. The projected date of sale will be August or September of 2017.